Your iPad prints without any physical connection to your printer. If you need to print a PDF from your iPad, you can either use Apple’s proprietary AirPrint service or one of the many apps available in the App Store. The options you can choose depend on your printer and the app you’re using to view the PDF you want to print. Either way, you’ll need access to the Wi-Fi network used by either your printer or PC. 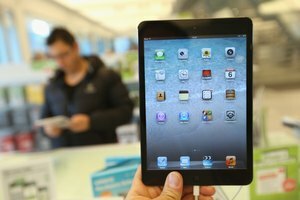 The launch of iOS 4.2 included the AirPrint software update for iPads, allowing them to natively print through apps. Apple’s Safari, Mail, Photos and iBooks support AirPrint, as do many other document and image apps, through the Share button. To use AirPrint, your Wi-Fi printer must support the AirPrint protocol; Apple maintains a list of supported printers (link in Resources). If yours is supported, open your document and press the Share icon. Tap the “Print” button and select your printer from the “Select Printer” item. Tap “Print” and you’re good to go. If your printer doesn’t support AirPrint, it may be supported by a third-party app. Apps come from printer companies themselves as well as software developers. 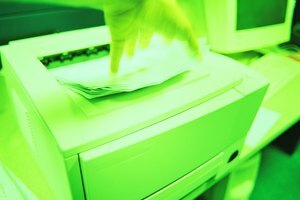 Apps such as PrintCentral, iCan-Print and Printer Pro offer support for many different printers and transmit their data over your Wi-Fi connection. For these, simply install the app and then print your document by tapping the Share icon and selecting the printer app from the sharing options list. You may have to move your document around if the app you use to view PDFs doesn’t support AirPrint or other printer apps. To do this, tap the Share icon and use the available options to either email the PDF or open it in another app. If you email it to yourself, you can then print it from the Mail app. If you can’t share the PDF, a potentially tedious option is to take a screenshot of each PDF page by pressing the Home and Power buttons at the same time. Screenshots are saved in the Photos app, and you can print them one at a time from Photos. 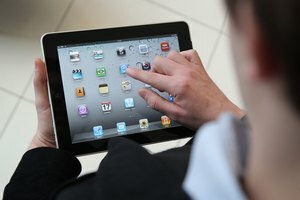 Printing to an unsupported printer or one that lacks Wi-Fi capabilities can still be done on your iPad as long as that printer is connected to your computer. PC software from Ecamm and Collobos Software and apps from companies like EuroSmartz can print from your iPad by connecting directly to your computer. The PC software works by sharing the printer with the iPad so the printer shows up in your print options. Apps send the data to the PC first, but the PC directs the printing job with no additional steps on your part. Both options can support a printer that’s connected directly to your PC but not to a home network. Whiting, Geoff. "How to Print a PDF From an iPad." Synonym, https://classroom.synonym.com/print-pdf-ipad-7823.html. Accessed 18 April 2019.